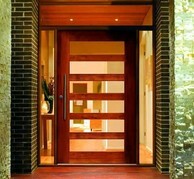 Stairpro - Doors Brisbane, introduced Custom Doors and Windows to their business mix in 2009. As a progressive company, Stairpro® is always on the lookout for opportunity to fulfill a need in the market. It all came about after discussions with some builders who were dissatisfied with delays they experienced with their normal suppliers. Stairpro® produce higher-than-usual, quality products, here in Brisbane, with exceptional customer service and support, still at competitive prices. The natural look of timber doors and windows, creates a charm and elegance only achieved by a natural product. Precision design and assembly using the highest standard of raw materials, ensure that Stairpro® Custom Doors and Windows will perform smoothly and consistently, year after year, for ultimate satisfaction. Stairpro® supplies a full range of timber custom doors and windows to suit any décor, architectural style, taste or budget. Stairpro® offers an extensive selection of features, including custom shapes to accent or enhance any room, adding beauty and character while providing superior energy efficiency and savings.